Interested in finding a balance between the rich memory of the former department store structure and the contemporary aesthetic of the culinary program and restaurant, the design embraced the raw nature of the existing space with a legible insertion of new materials, careful lighting and vibrant colors. 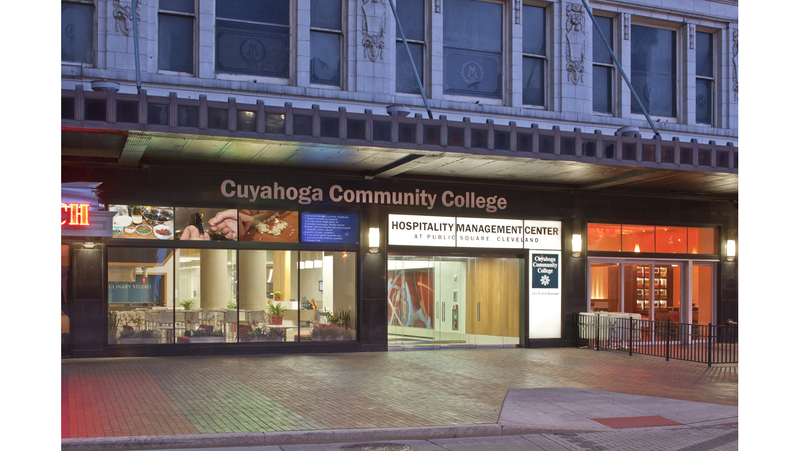 Cuyahoga Community College’s new Hospitality Management Center (HMC) activates downtown Cleveland’s Public Square with a fresh, new culinary experience. 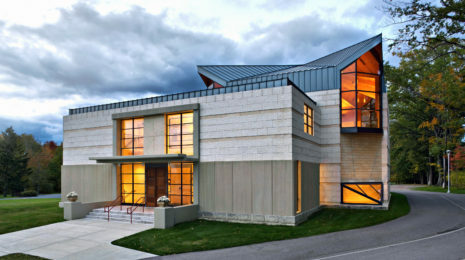 The project creates a new image for the college in the way of a contemporary, forward looking architecture. 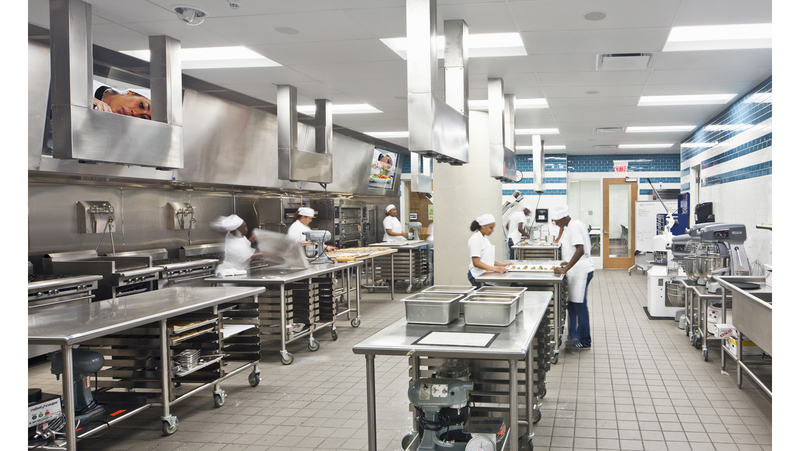 HMC is an inviting community nexus that appeals to a wide audience through the art of cooking. Interested in finding a balance between the rich memory of the former department store structure and the contemporary aesthetic of the culinary program and restaurant, the design embraced the raw nature of the existing space with a legible insertion of new materials, careful lighting and vibrant colors. 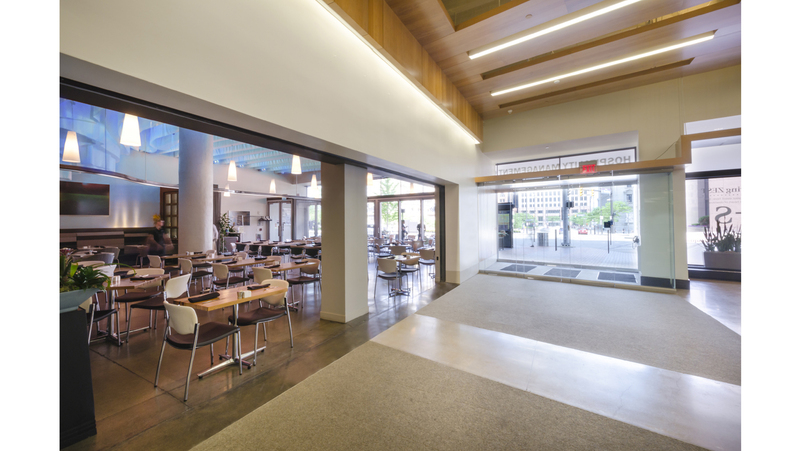 A new all-glass storefront celebrates and clearly communicates the activities within–both through its transparency and with four contiguous rear projection video screens that allow viewers on Public Square to be voyeurs in the culinary experience. 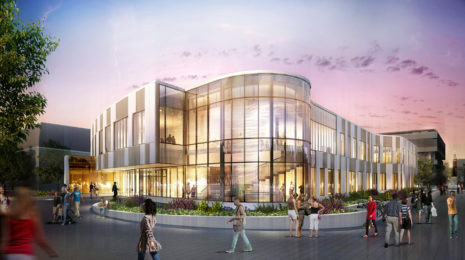 The rear portion of the lobby houses the theater style demonstration kitchen where professors and celebrity chefs come to put on an inspiring culinary show. 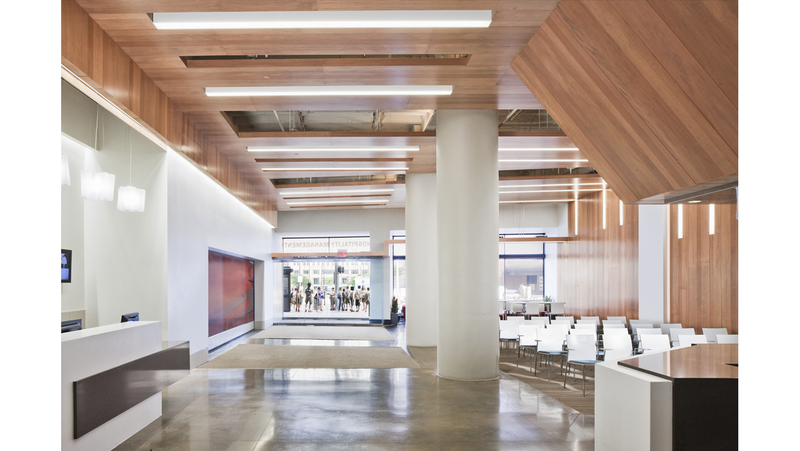 The space is framed by angular wood shells with linear lighting that contrast the exposed concrete super-structure. 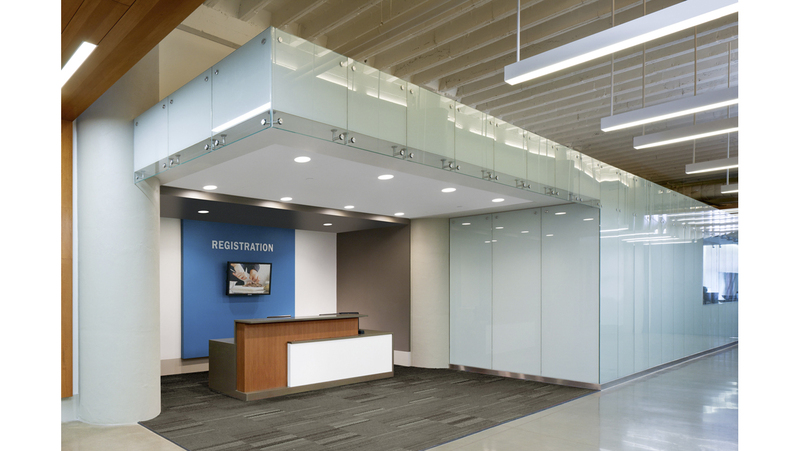 The lobby acts as a direct link between HMC and the adjacent private restaurant, Pura Vida (pure life), with a vertical-lift wall that can combine the two spaces for special events. 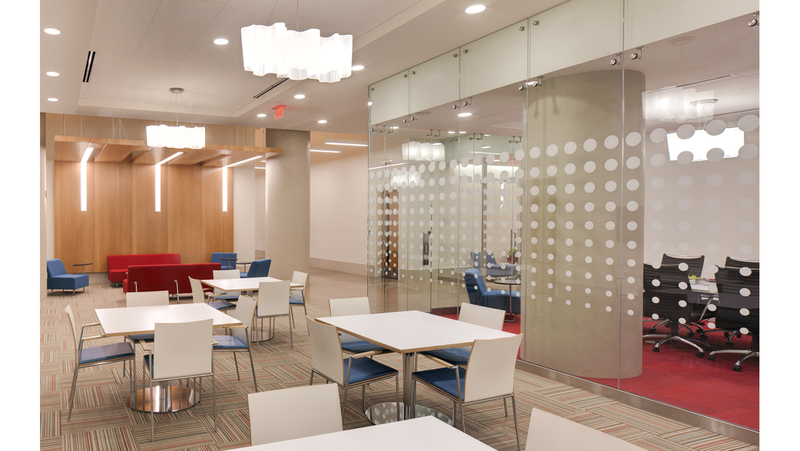 Glass walls admit views into the restaurant kitchen allowing the culinary students and visitors to see the instruction process in action. 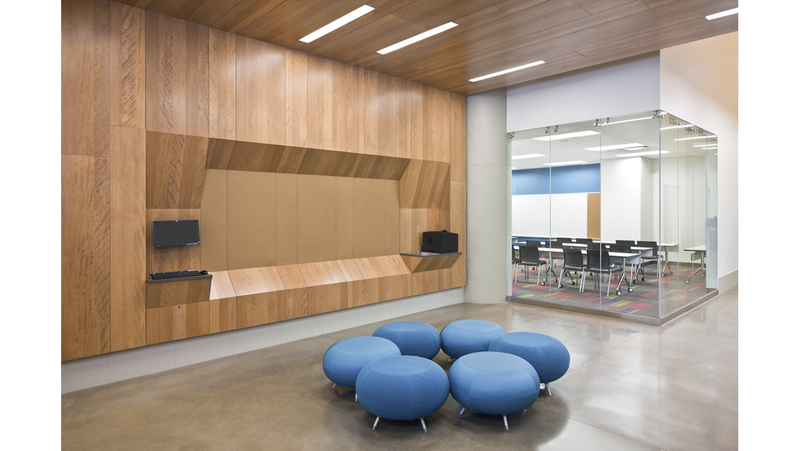 Additional wood and light elements appear further along the central spine of the HMC space and identify key nodes for student/professor interaction outside teaching kitchens, classrooms, offices and a conference center. 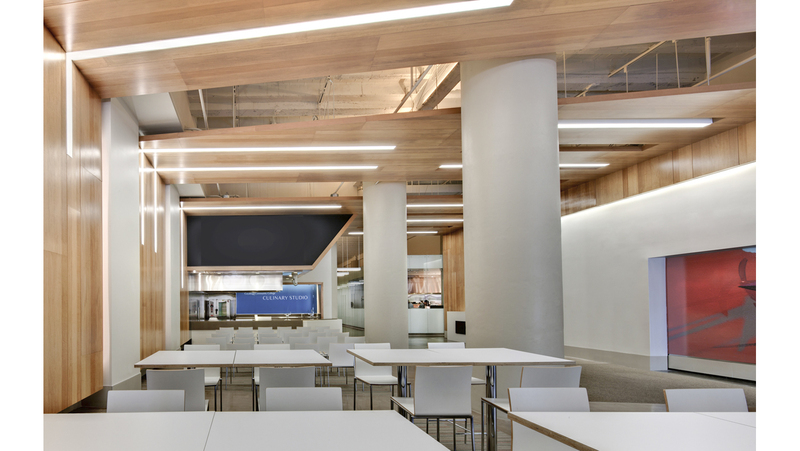 As a space that engages culinary professionals and restaurant-goers alike, HMC demystifies the art of cooking by celebrating a shared human experience.